In a quest to remain undefeated and remain in the hunt for their first shot at the College Football Playoff, the No. 5 Notre Dame Fighting Irish (6-0) return to South Bend to take on the Pittsburgh Panthers (3-3, 2-1 ACC) on Saturday afternoon. 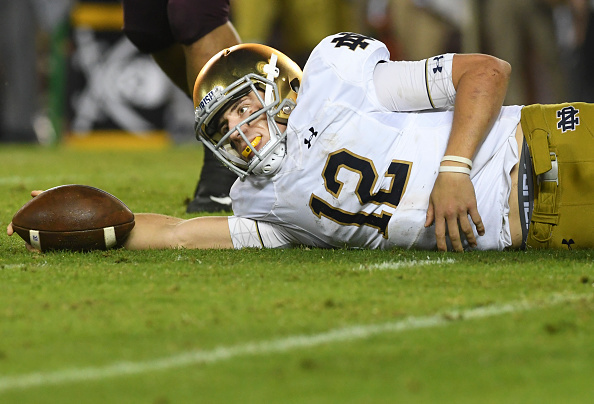 The Irish compiled 438 yards of total offense en route to a 45-23 victory over the then-No. 24 Hokies. Dexter Williams led Notre Dame with 178 rushing yards and three touchdowns, including a 97-yard touchdown run. Williams’ 97-yard run was the second-longest rushing score in Notre Dame history— Josh Adams had a 98-yard touchdown run against Wake Forest in 2015. The Panthers are coming off a strong overtime victory over the Syracuse Orange, who received votes in last week’s Associated Press poll. The trip to South Bend will be the third time this season that Pittsburgh will play a team ranked inside the top 15— Penn State in week two and UCF in week five. Kelly is no stranger to the fact that Pittsburgh has upset top teams in each of the past two seasons. Notre Dame fans were sent into a brief panic earlier this week when rumors surfaced that starting Ian Book would be facing disciplinary actions for cheating on his midterm exams. Those rumors were quickly dispelled and Brian Kelly addressed the situation on Tuesday during his mid-week press conference. “No, Ian Book will be the starting quarterback on Saturday,” Kelly said. Pittsburgh’s defense sustained a substantial blow when linebacker and captain Quintin Wirginis underwent season-ending surgery after suffering a non-contact knee injury in practice on Tuesday. Wirginis led the Panther defense in almost every statistical category— tackles, tackles for a loss, sacks and forced fumbles. Kicker Justin Yoon became the all-time leading scorer in Notre Dame history in the victory over Virginia Tech. Yoon now has 322 points, surpassing former Irish running back Allen Pinkett, whose record of 320 points had stood since 1985. Notre Dame leads the all-time series against Pittsburgh 47-27-1. In their last meeting, the Irish were victorious by a score of 42-30 on November 7, 2015. At Notre Dame Stadium, Notre Dame is 20-10 against Pittsburgh, which the last meeting being a 29-26 victory in triple-overtime on November 3, 2012.